A beautiful alpine village, Morzine has a bustling centre and is packed with great facilities. With fabulous restaurants and bars, a weekly market, ice rink, swimming pool and ski joering all perfect for keeping the whole family entertained. Morzine can be found between Lake Leman and Mont-Blanc and has kept its 11th Century Savoyard look where you will find traditional wooden chalets with slate roofs which makes you feel like you are in a real alpine village rather than a large man-made ski resort.Les Portes du Soleil is a major skisports destination in the northern French Alps (Chablais Alps) encompassing thirteen resorts between Mont Blanc in France and Lake Geneva in Switzerland. With more than 650 km of marked pistes and about 200 lifts in total, spread over 14 valleys and about 400 square miles (1036 square km) Portes du Soleil ranks among the two largest ski areas in the world (the other being Les Trois Vallees). Almost all of the pistes are connected by lifts - only a few marginal towns can only be reached by the free bus services in the area. There are twelve resorts in the Portes du Soleil area, of which seven are French and five are Swiss. 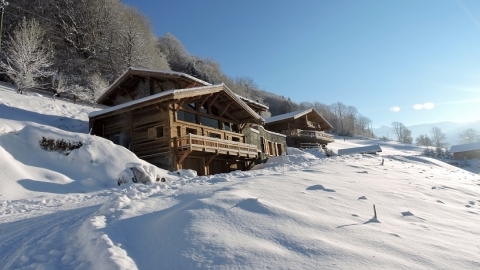 We have some beautiful winter ski chalets in this area.